Another successful day of fishing. 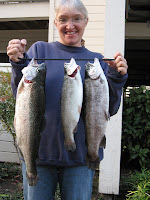 Yesterday we went to Lake Chabot and this was the catch after about 4 hours of fishing. A little slow, but worth the wait! Today we will plant most of them in the garden so they can do their job on the future tomatoes. We eat some and plant some to eat later in a different form. 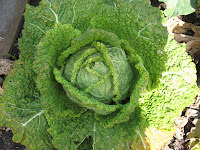 Here is a nice head of cabbage growing in the garden right now where some fish had been planted before. It is all about the circle of life. 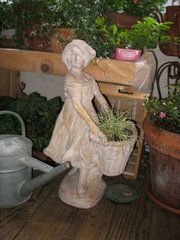 I will be heading off to the garden shortly to do some weeding and planning for the new spring garden. There are a few weeds and some frozen plants to be pulled. Also some bulbs that need to be planted! It has been a COLD January! 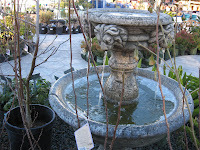 We had lots of ice at the nursery and some frozen plants. We didn’t loose very many plants fortunately because we have been doing a lot of icing off. I got an urge to sew probably because of the weather. 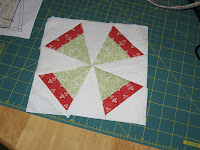 Quilting has really peaked my interest so I am trying a small one. 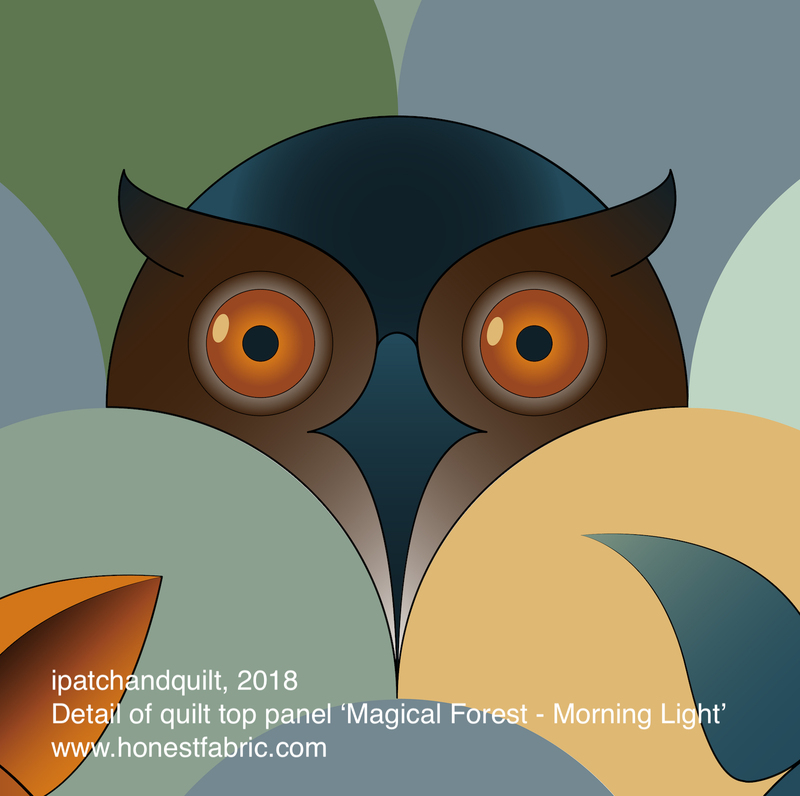 I really don’t have room here to do anything big and I would probably loose interest so I am working on something more the size of a table topper. 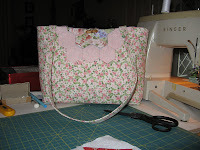 First though I started with a bag which was a lot of fun and now holds all my quilting stuff. I was making it for my sister, but will have to make her another one. Sorry Philina! Some fishing days are just plain 'Lazy Days'. This was actually a picture from one of those kind of days last week. The fish weren't biting and the only thing to do was watch the birds and keep changing the bait to see if you could find the one thing they might want to eat today. The pelicans were busy and I observed them eating a few fish so I knew they were there. It was a little cold so they were probably not feeling too hungary. 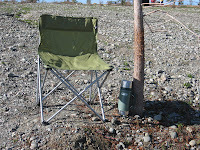 I h ad my coffee to keep my warm and a chair to take a break in once in a while. That was all I needed to make me content. 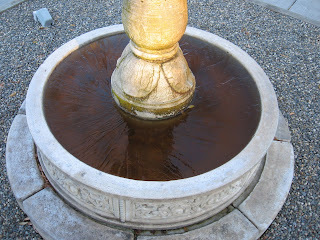 I did a little walking around and taking pictures of some of what I was observing in nature. 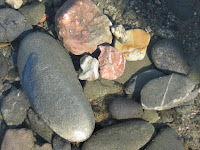 Quarry Lake has a lot of really neat rocks being that it was once a rock quarry. They look even more beautiful when they are wet so I tried to shoot some pictures of them. I was finding the little finches pretty entertaining as they were flitting back and forth i n this tree seeming to land first on one branch then another. I guess they were eating something, but I'm not sure what it was. It really was a wonderful lazy day! So much to see...so much to do...the whole day to do it! 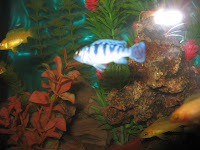 We have recently aquired a few new fish for our aquarium. We are trying our hand a Cichlids. They are so much more colorful and interesting than the platys we had before. The platys had given birth several times in our tank which was really fun to watch, but the last batch was getting old and dying off so we decided to switch to something different. I'm not sure if you can see the little blue guy in the picture since the flash made a bit of a glare on the glass, but the colors are pretty intense. We also have some bright yellow ones and orange ones and several blue striped ones. These fish are from Africa and will get a little larger than the platys we had before they also have more personality so they are really fun to watch. We are off to a good start for the new year. 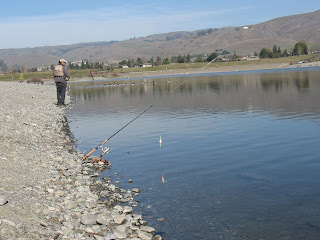 The weather was gorgeous so we went fishing for a few hours at Quarry Lake. We caught a 4 pound trout, but let it go. You can only eat so much fish you know. It was a very pleasant and relaxing day in every way! 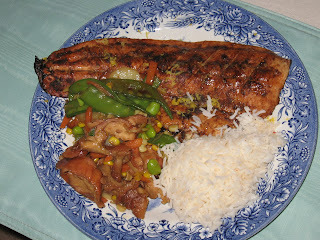 Sorry if this offends any of our vegetarian friends, but here is that tasty fish after Michael cooked it on the BBQ. It really was an exquisite meal.